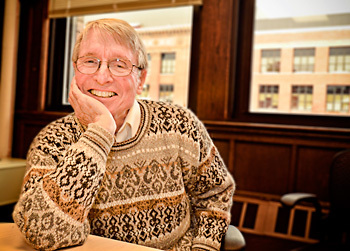 It is with great sadness that I report the death yesterday of Prof. John H. Holland, Professor of Psychology and of Computer Science and Engineering at the University of Michigan. John, 86, succumbed to an illness he had been dealing with for a few years, although he did manage to publish two books in the last three years in spite of it. Until very recently, he was as full of ideas and as animated as ever. John invented genetic algorithms in the 1960’s, proving a number of theorems about them before they had been so named. He also pioneered then what are now called “learning classifier systems,” although he called them only “classifier systems.” John led the development of a marvelous multi-disciplinary Ph.D. program at UM, in “Computer and Communication Sciences.” He was the reason I went to UM for my Ph.D., and was my teacher and mentor in learning about genetic algorithms, although his former student Bernie Zeigler served as my academic advisor, so I am formally Holland’s “academic grandchild.” John founded the Logic of Computers Group with the late Prof. Art Burks, another brilliant thinker (logician and automata theorist) and co-inventor of the ENIAC Computer at Penn. John was largely responsible for making that research group an inspiring place to work and a fun place to spend as many hours as possible each week! After publication of John’s book “Analysis of Natural and Artificial Systems” in 1975, he became widely recognized and lauded as the father of GA’s. He received many awards, including the MacArthur Fellowship, the Louis Levy Medal, and UM’s highest award for a faculty member. John was also a co-founder and still a Trustee and External Professor of the Santa Fe Institute, which has been for many years a leading place where economists, physicists, computer scientists, biologists and others formulated the concepts of complex systems that are so important in science and economics today. Many of these leaders were Nobel Laureates, and John was highly esteemed among them. He wrote many books on complex systems, many of which were inspired by his study of the basic requirements for spawning of living organisms. UM’s Center for the Study of Complex Systems was the brain-child of the highly multidisciplinary BACH group, of which John Holland was a founder–Burks (Art), Axelrod (Bob), Cohen (Michael), and Holland (John). Others joined the group after the 1980’s. I am greatly saddened by John’s passing–he has always been a great inspiration to me–but I take consolation from knowing that his memory and his legacy will survive long beyond our generation of scientists.